July 2015 – My Story – ISB and beyond !!! 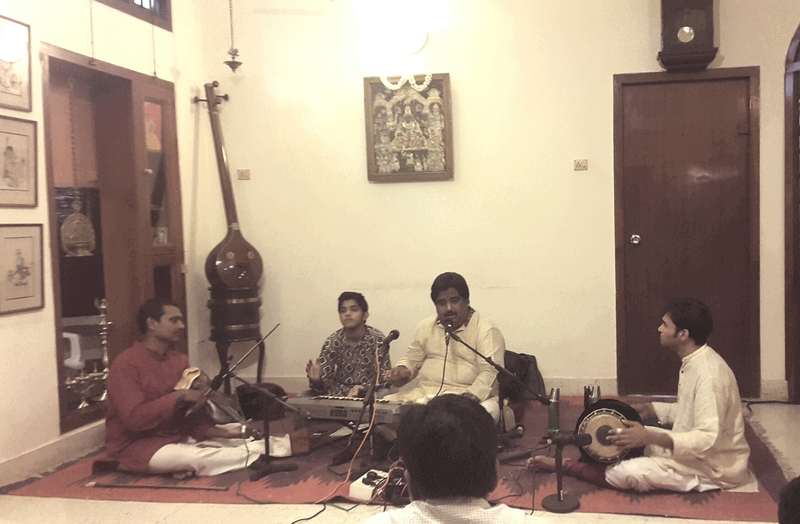 The multi-talented Palakkad Sreeram switched effortlessly between vocal, keyboard and flute. He sang and played so well! Shertalai Sivakumar was very good on the violin. Anantha R. Krishnan was a class apart! Here is part 4 of the series I am writing on the science behind music in “Saamagaana – The First Melody“, a monthly magazine on Indian Classical Music. The intent is to help readers understand a bit more about the science behind music and musical instruments and to enhance their appreciation of the same. How is it that I am able to hear a vocalist loud and clear in an auditorium, even though I am seated far away from him? When the vocalist sings, he produces sound waves. These flow into the microphone in front of him. A thin material called the diaphragm vibrates inside the microphone when struck by these sound waves. These vibrations are then converted into electrical current which is boosted using an amplifier and passed on to the loudspeakers present in the auditorium. The loudspeakers do the opposite of what the microphone does. They convert this boosted electrical current back into boosted sound and it is this sound that you hear loud and clear at your seat in the auditorium. I went to a concert of the violinist A. Kanyakumari and couldn’t see any microphone in front of her. How then does her violin sound then get amplified? Microphones come in different varieties. A. Kanyakumari usually uses a contact (pickup) microphone which is placed on the upper part of her violin, instead of having a microphone placed in front of her. You can identify this microphone if you notice her violin carefully in the next concert of hers that you attend. Contact microphones sense vibrations/sound waves through contact with the body of the violin. In the concert I attended last week, the vocalist moved away from the microphone at times and couldn’t be heard well. Why? I have attended other concerts of hers where I could hear her well even if she moved away. The vocalist may not have used an omnidirectional microphone in this particular concert. While an omnidirectional one can pick up sound equally from any direction, a unidirectional microphone picks up sound predominantly from one direction and a bidirectional one picks up sound from two opposite directions. If the vocalist did not use an omnidirectional microphone, she might have at times moved away from the direction(s) from which it can pick up sound. The microphone could not have properly picked up what she was singing at these times and hence she may not have been heard well. I see the artists on stage sometimes signaling to the guy manning the audio equipment to increase the volume further. How does he accomplish this? The equipment he has in front of him allows him to control the amplification of the sounds that come from each of the microphones on stage. Depending on which performer is sounding lower and/or is requesting for a higher volume, he can boost the sound coming from that performer’s microphone and make it sound louder through the loudspeakers in the auditorium.